Groundwork works with a variety of partners to change places and lives within local communities. The £5,000 donation from Amazon Tilbury was used to develop outdoor STEM school sessions, which focused on using technology to discover the natural world and citizen science. Groundwork worked with Warren Primary School in Grays, delivering four sessions over two days, to a range of classes within the school. 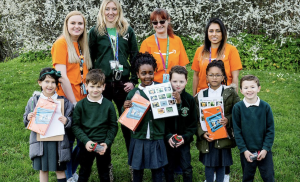 The sessions used a variety of apps to help the pupils discover local wildlife. In addition, Amazon Tilbury also supplied Warren Primary School with four Kindle devices. The donation forms part of the “Amazon In The Community” programme whereby the company supports the communities around its operating locations across the UK.